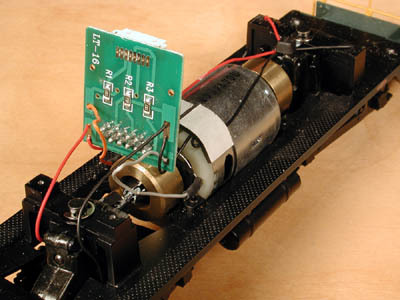 The 2004 Christmas Locomotive MEC SW-9 had an error on its PC board which effects conversion to DCC. The pins for the NMRA 8-pin Medium Plug were layed out in the wrong order. 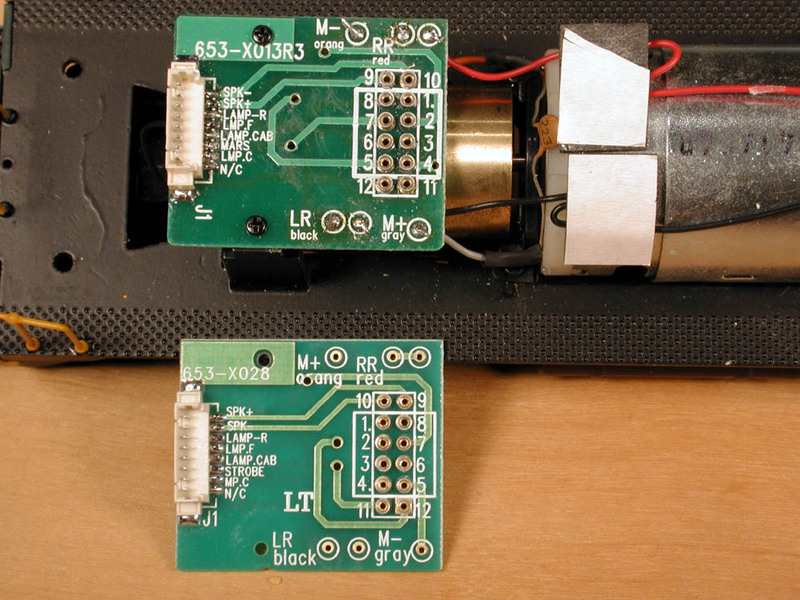 Thus a standard DCC decoder with the NMRA plug can not be plugged in. These boards all have "NO DCC" stickers on them, and locos that were shipped with these boards have the stickers on the bottom of the loco and on the box. Here are the old and new boards. The one in the loco is the "No DCC" board (I already removed the sticker) and below it is the new one. Notice the large LT in the middle of the new board. If you look at the numbering for the NMRA socket, you can see the top one is swapped left to right. 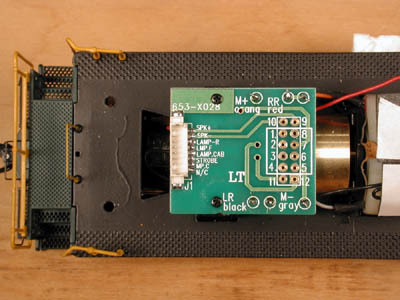 The board is mounted with the 2 tiny screws that you can see, and connected by 6 wires. There are 3 solder pads at the top, and 3 at the bottom. The wires need to be removed from the old board and soldered to the new board. First remove the two screws. I used the same screwdriver as I used to remove the body frome the frame. Here's the underside of the board. You can see the 6 connections. On the left (Fireman's) side there is a grey wire from Motor -, a black wire from the left rail front truck, and a black wire from the left rail rear truck. The right side has orange from Motor +, and a red wire from each truck. 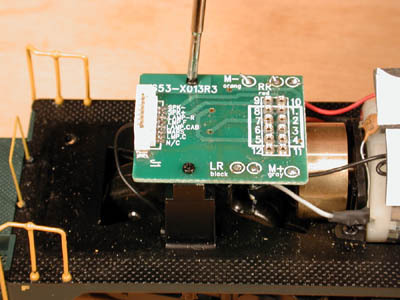 Pull lightly on the wire as you apply heat to the other side of the solder joint, and the wires come right out. Solder the wires to the new board in the same orientation. The red wires go in the two holes labeled RR Red, either wire in either hole. Same for the black in LR Black. Orange and Grey are both labeled. 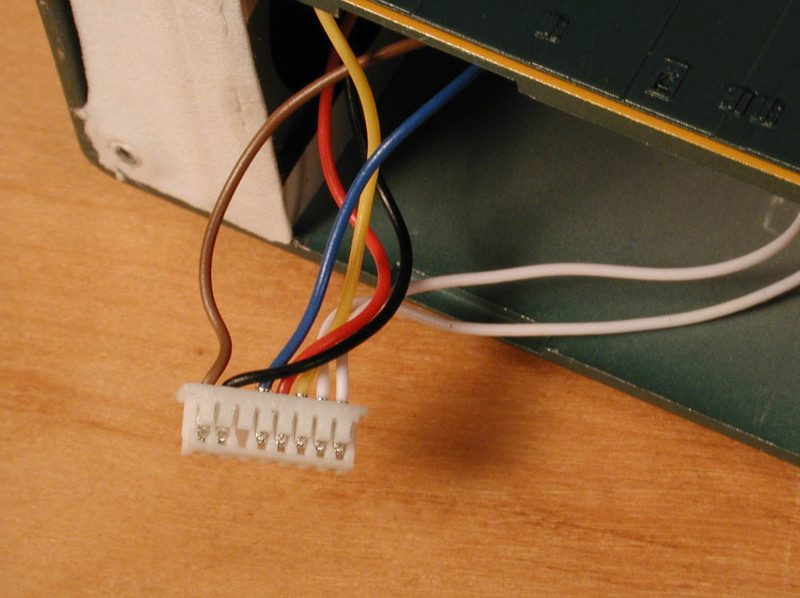 When you screw the board back in place, be careful not to pinch the wires. Make sure they are routed so there is no strain, and they don't rub on the flywheel. Here is the new board in place and all wired up, ready to plug in the decoder! One last step. 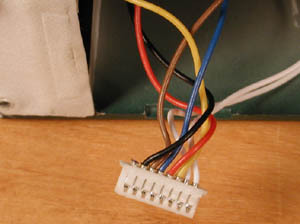 The brown wire in the white plug from the body needs to be moved to the last position on the plug, where there is currently no wire. 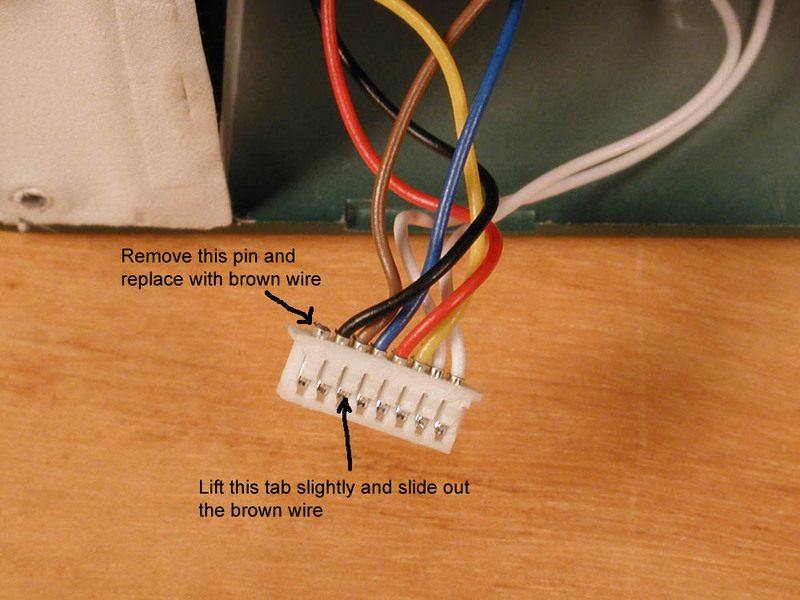 The wire will come out easily if you lift the little plastic tab with an exacto blade or a pin, then pull the wire gently.Remove the empty pin from the last position on the plug the same way. The bown wire with its pin will then just snap in. 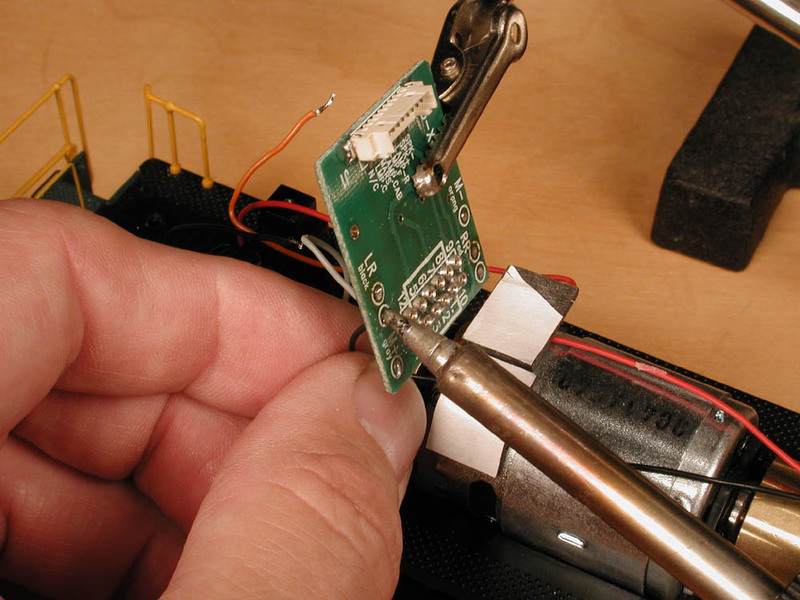 This job takes about 30 minutes if you are set up for soldering.